Here’s a deleted scene from the eighth episode (11:00pm-12:00am) of 24 Season 8. 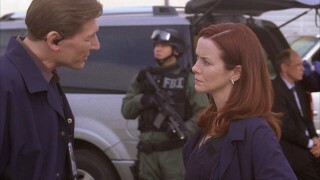 Renee Walker reveals to Chloe O’Brian that she wanted to contact Jack Bauer but was afraid – Renee was in a dark place and with Jack finally being happy, she didn’t want to drag him into her personal issues. Renee Walker: I should’ve called him back. Renee Walker: Jack. I tried calling when he got out of his coma. He left seven messages and I didn’t return any of them. Chloe O’Brian: He told me that. He assumed you didn’t wanna talk to him. Renee Walker: Of course I wanted to talk to him. I was, I was just afraid. Chloe O’Brian: Afraid of what? Renee Walker: I was in a really dark place and I didn’t want to bring him there with me. I couldn’t do that to him, not after he’d finally found some peace in his life.